Deliverbooze: Will Heineken tie-up benefit food delivery company? December 08, 2016, 5:17 p.m. The partnership will enable consumers to order Heineken lager and cider through the food delivery service’s app. There seems to be room for expansion in the alcohol delivery sector and YouGov Profiles data points towards the potential this particular tie-up has. Looking at those that are aware of Deliveroo’s current offering, we see that they are more likely than average person to drink lager at home. Indeed, 42% say they have drunk a modest amount of lager (one to 15 bottles or cans) at home in the last four weeks, compared to 34% of the general public. So while potential customers may be more likely to drink lager in the house, the test will be persuading them to shift away from their traditional purchasing habits to try something new. The move comes shortly after Deliveroo completed a rebrand that encompassed its logo and marketing. The rebooted advertising is showing early signs of success. 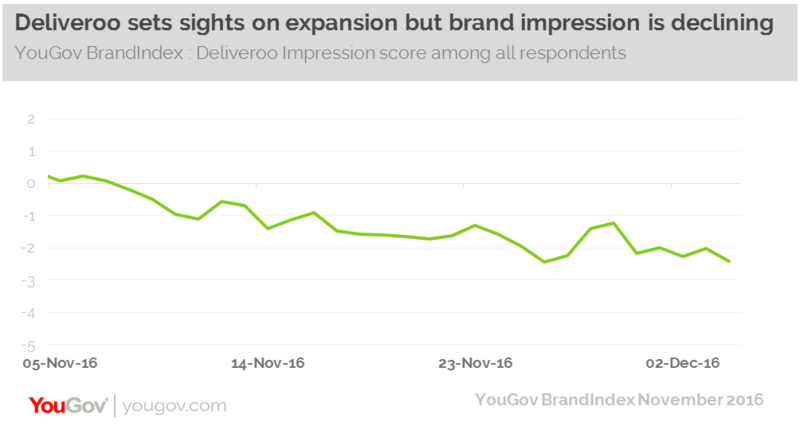 The brand’s Ad Awareness score (whether someone has seen Deliveroo adverts in the last two weeks) is currently standing at +8 among all respondents, the highest it has been since YouGov began tracking the brand. While the move should be broaden Deliveroo’s appeal to consumers, there must also be a word of caution. Firstly, it is unlikely that Deliveroo will be alone in serving this relatively untapped customer base as there could soon be competition from the likes of UberEats. Secondly, the company’s business model has attracted criticism. The recent swirl of headlines about the ‘gig economy’, which underpins Deliveroo’s operations, included a legal challenge from two Uber drivers who won the right to be considered employed rather than self-employed. Some Deliveroo drivers are taking similar legal action. Possibly as a result of the adverse publicity, the company’s Impression score (whether someone has a positive or negative impression of the brand) is negative. So while Deliveroo continues to be innovative and introduce new services to customers, it is not all good news for the brand and although it is developing its business, it also may need to bolster its public perception.